These days, a group of teens and students from Germany are spending 6 days in Israel. 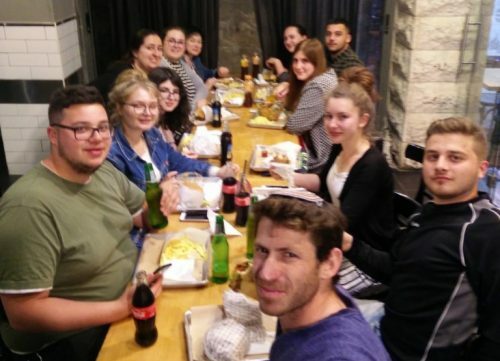 As representatives of The Association of Communities in Bavaria, 3 young men and 6 young women are preparing to be madrichim in an upcoming camp. These camps are a highlight of Torah Mitzion’s activity in Germany and represent the culmination of a decade of impact. The current staff has been nurtured over the years by the Kolell in Germany. In the camp the participants will be taking part in the Redemption of the Menorah project. 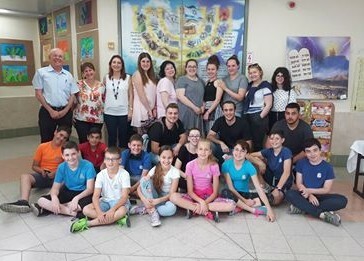 This unique program was developed in Israel by the artist Yakov Rosenwasser and Ms. Diti Parver (principal of Lea Goldberg School in Netanya). Or Parver, our shaliach in Munich last year, is running the program, together with the head of the mishlachat Rabbi Yechiel Brukner, and his wife, and with Bavarian Youth coordinator Luba Simiyenka. David Katzar, a convert and recent oleh and is giving the tour to the group of madrichim. David made Aliya from Regensburg following the deep connection he made with the Torah MiTzion shlichim. He is currently a resident of Rabbi Yechiel and Sarah Brukners’ community in Tal Menashe. This is also where the group spent a most elevating and memorable Shabbat.